The small-town charm of Bequia makes it an ideal cruising spot for sailors in search of seclusion. It is also one of the most remote islands in the already remote Grenadine Islands. 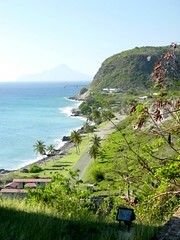 Pronounced ‘beck way’, the island is situated nine miles south of St Vincent and has a population of fewer than 5,000 people. Life on Bequia is slow and relaxed. There are no crowds and hardly any noise – this quaint Caribbean paradise is geared for activities around its waters like yachting, diving, snorkelling – and lazing on sunny shores. Bequia is the perfect spot to practice the art of doing nothing but enjoy stunning surrounds. The sprawling beaches with their soft white sand, majestic palms and calmly lapping waters are tranquil all through the year. The scenic natural harbours and lush green hillsides slope into turquoise waters where dozens of yachts are gathered. Bequia is proud of its history as a prime yacht building location, and one of its main bays, the Admiralty Bay, is the most protected natural harbour in the Caribbean. In Admiralty Bay you will find Port Elizabeth, the island’s most active area. Strolling through the local market you will notice a great variety of fresh produce the open-air stalls as relaxed locals ply their wares. There is also a small and friendly local dining and drinking scene with several good restaurants and bars dotted along the waterfront pathway, known as the Belmont Walkway. Walking along Belmont Walkway you will experience a variety of smells wafting towards you. Included in the variety of restaurants in the area, you will find a delicious fusion of West Indian and French cuisines at L’Auberge de Grenadine’s or you can tuck into a delectable lobster pizza at Mac’s Pizzeria. Bequia is the perfect destination if you are looking for smooth sailing, good food and absolute tranquillity.